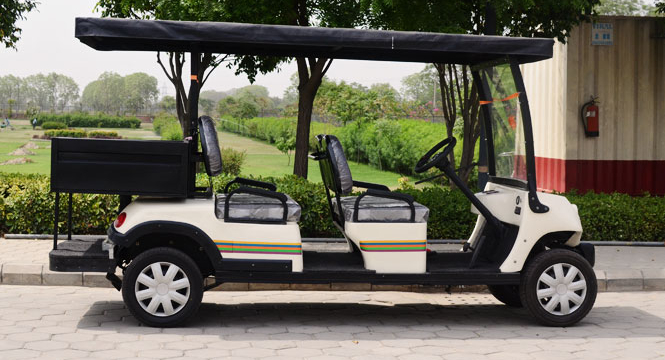 When OP Jindal University contacted us for their custom requirement, we customized our popular six seater variant of our golf carts to accommodate a loader attachment therein. This allows for the University students to easily be transported along with their luggage through the campus and outside. We provided branding on the body of the golf cart loader to integrate the logo of the University along with the band of colors that is synonymous with it. The idea was to integrate the vehicle as an indispensable addition to the expansive premises and ensuring tireless movement of people and their materials through the day. 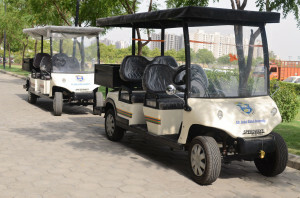 All this with ensured comfort and durability of our ever improving range of golf carts. We ensured that proper safety requirements are met within the vehicle to ensure safety of not just the riders and driver but also of those whowwalk through the complex. Side mirrors were installed for safety measure and the speed was capped to a safe maximum. The tires installed were suited better for the road so to extend the life and running capacity of the vehicle. The loader was provided with rubber matting to ensure any material doesn’t damage the body of the loader attachment itself. 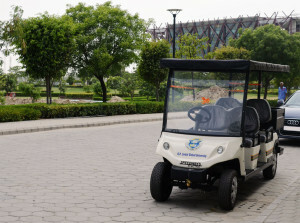 We are proud to have our golf cart loaders serve as indispensable additions to the University premises, serving students, staff and visitors endlessly along with any materials that need to be transported within and outside the campus. The vehicles are technically superior to ensure good torque no matter how much weight is being loaded on and powered by our special electric vehicle batteries that run endlessly without having to recharge. We look forward to serving the OP Jindal university with more of our unique and useful electric vehicle additions and thank them for their trust in us.